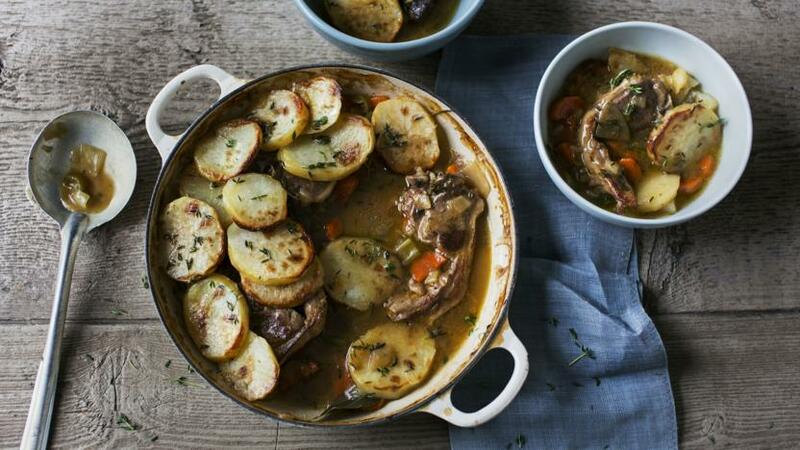 This delicious Lancashire hotpot is so simple to make and so satisfying to eat - it will brighten up many a weekend. Season the lamb chops with plenty of salt and freshly ground black pepper. Heat the oil in a frying pan over a medium heat, then fry the lamb chops for 2-3 minutes on each side, or until browned all over. Transfer the lamb chops to a medium casserole. Fry the carrot, celery and onion in the same frying pan for 4-5 minutes, or until coloured and softened. Stir the flour into the vegetables and continue to fry for 2-3 minutes, or until the flour turns a biscuit colour. Transfer the vegetables and thickened stock to the casserole. Add 7 thyme sprigs and the bay leaf, then bring the mixture to the boil. Reduce the heat until the mixture is just simmering. Melt the butter in a small saucepan over a medium heat. Arrange the potato slices on top of the hotpot, overlapping the edges slightly. Brush the potato slices all over with the melted butter. Sprinkle the top with a few thyme leaves from the remaining sprig of thyme. Bake the hotpot in the oven for 1-1½ hours, or until the potato topping is crisp and golden-brown and the vegetables are tender.